Faced with mounting costs of upgrades for maintenance on our existing bandwidth shaper, in 2014 we did a little research and decided to try the NetEqualizer. We are currently running 1 gigabit for the entire campus, including students and faculty. Our bandwidth utilization is maxed out for most of the day and into the evening. Without a solid bandwidth shaper in place, operations would come to crawl. Since deploying the NetEqualizer in the Spring of 2015 we have pretty much forgotten about it (in a good way). The NetEqualizer allows us to run at full capacity without the hassles of making adjustments on a daily basis. One of the best investments we have ever made. ...The NetEqualizer has been a great solution because it is extremely easy to maintain, and – when needed – it just works, says Derek Lustig of HWS. 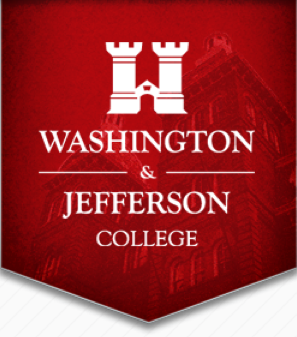 Delaware Valley University shifted from a packet shaping tool to a NetEqualizer over a year ago, and it is one of the best infrastructure decisions we have made. The NetEqualizer has allowed us to provide better service to our students without increasing bandwidth, and we hear fewer complaints than ever about bandwidth. We are planning our next bandwidth increase, and the NetEqualizer is going to make this better than usual. Factoring in student satisfaction with the amount of time that we no longer have to spend tuning a packet shaping device has made us very happy customers. The support and sales teams at NetEqualizer are also fantastic. Morrisville State College network administrators recently upgraded to the newest software version (Release 8.3) and are excited to utilize the new Real-Time Reporting (RTR) features. After working with the new reporting interfaces for a few weeks, MSC reported back that they love access to real -time data and the ability to slice and dice the information in various ways with the graphs offered by the NetEqualizer. In particular, they like seeing something simple like bandwidth usage interpreted and reported in many different ways, as available in Top Talkers (bar chart of the biggest bandwidth users), Penalty Histories (graph showing when equalizing kicked in on the network), and the classic Active Connections table (all usage for all IPs on your network in real-time). We installed a behavior-based shaping device (NetEqualizer) that controls the amount of total simultaneous connections an IP address can make, in addition to controlling bandwidth hogs. P2P is held to a minimum because P2P activity, in general, creates many connection simultaneously; normal web traffic does not - so limiting connection is a very effective P2P controller without actually stopping legitimate use. The power of the unit is both connection limits and shaping large bandwidth streams; everyone gets a piece of the inbound/outbound pie, and if the trunk is not saturated, they also get max performance. When many students are in contention for the internet, and the trunk is saturated; large streams get slowed by the NetEqualizer (fractions of a second) until they back down to a reasonable level. It slows the hogs in small increasing increments, and everyone gets through. Small streams (Skype, Voip, simple web browsing, etc)….are unaffected and no one really notices that they are being controlled. During the nighttime hours, the campus population hammers our internet connection mercilessly for hours on end, but the NetEqualizer smoothly controls all inbound/outbound traffic so everyone gets better performance than they used to with our previous device. And those outside of our network can still reach our web servers; prior to the Netequalizer, when the internet links were saturated, getting web traffic to and from our servers sometimes posed big issues. The best part is we don’t have to device-sit – the NetEq has made management of traffic a no-brainer these days; we used to spend a great deal of time managing the old packeteer, but no more. I love this machine ! (and RIAA notices are virtually nil...and no student complaints about slow internet!) Did I mention that I love this machine? The device has a great return on investment; had we put it in prior to increasing our bandwidth, we could have probably kept our old ISP contract size for another year or so before increasing. I would urge anyone who manages bandwidth for any reason to give Netequalizer a chance to show how easy and cost effective a solution it can be. At Young Harris College, our network supports 47 buildings and residences for our 1,200 students. Prior to 2007, we had a Packeteer in place to shape our networks, and found that we were having to tweak it on a regular basis, sometimes weekly, in order to keep our policies working as needed. Like many others, when we were told that our equipment was "end of life", I decided it was time to look at other options. My goal was to find a shaping solution that required less management. I found that in the NetEqualizer. Once I had the NetEqualizer set-up and configured, I have spent very little time managing it - it just works! This product is great! And I love that our students are not even aware that they are being shaped - I just don't get any complaints about bandwidth. The NetEqualizer ensures that network hogs do not take over my network during peak periods. I also like how the NetEqualizer has grown with us. We started in 2007 with an NE2000-10, and traded that in for an NE3000-50 in 2011. In 2012, I upgraded our license to 1Gbps, which is what I am running today. And the future? We are planning for off-site campus locations, to expand YHC's offerings, as well as the communities we can serve. I am working with the folks at APconnections to map out NetEqualizers to support several of our new locations, as I know that I need to guarantee a quality online experience Day 1. At Loyola University Chicago, we are on our 2nd iteration of the NetEqualizer. We used the product happily for a number of years when we had a T3. We upgraded our internet pipe to 100MB and after about 6 months we noticed 100% saturation and students complaining of slow internet for various applications. We knew then that we needed another NetEqualizer. Once we plugged the box in it started managing the bandwidth, our pipe has not been saturated since, and more importantly the complaints have ceased. I've been very happy with the NE2000, it's a solid box and has never given us any grief. I also appreciate its content-agnostic approach to bandwidth shaping. Many of my peers spend a lot of time tuning their traffic control devices to catch/except various L7 protocols, and I am glad not to have to play that game. Many of them are also paying a lot more to purchase their appliances, with very high annual SnS (software and support) costs. Again, I really appreciate your product and excellent service. I am also impressed with the pace of upgrades and added features over the past couple years. Keep up the good work! Thanks again for such a great, easy to use product. At Drew our NetEqualizer continues to work very well, so thanks for making an excellent product that just works and does what it says it will very well. It is usually one of the things I mention to people as a "best thing we've bought" type device, as it really is SO easy to use and configure and really does keep everything usable. Thanks for making an excellent product! The NetEqualizer works so well, I rarely have to do any administration on it! NetEqualizer is truly is a set it and forget type of appliance. I used another vendor's product years ago and I was always working on it, frequently digging around to find heavy use users and products; it was a never-ending process. Sometimes I would spend up to 20 plus hours a week on QoS. With NetEq, I have spent maybe 3 or less hours doing administrative tasks over the last 6 years. With the purple product company's device, I would usually spend 3 hours daily before lunch. NetEq is Rock Solid and ROCKS! We've been using your NetEqualizer 350Mbit unit since the Spring. I had been looking for a dynamic equal-bandwidth policy based unit for quite some time, and had been unsuccessful. The NetEqualizer was a fraction of the cost of other solutions, took me all of five minutes to configure, and works wonderfully. I have had many students come to my office for the express purpose of thanking me for buying more bandwidth, which I didn't - I just replaced our Packeteer with a NetEqualizer. Their engineers convinced me that I didn't need to put in any exceptions or special policies for specific areas of campus or servers, and he was right - the almost-default configuration works great. On top of all of this, at the core it's just a 1U debian box with a flash drive. There's nothing I like better than standards-based, open-source-based networking solutions that I already know how to work with. Good job guys! You guys also answered me outside of stated support hours. Thanks! You consistently provide the highest level of support I have ever received from any company, bar none. Also your product is fabulous. I have recommended it to all other four colleges in the Pioneer Valley. We've had NetEqualizers on campus at Reed for several years and continue to be very happy with the product . We have a very small staff and don't have time to "tune" a device like a Packetshaper. Instead the NetEqualizer is protocol agnostic in the way it shapes traffic for most users but also allows us to quickly prioritize some traffic if necessary. Over the years the NetEqualizer has saved us countless hours of staff time. We did lose some visibility into what is happening on our border network but our IDS/IPS replaced that functionality. NetEqualizer is an excellent product. NetEqualizer is great! We've really had no issues at all. We literally dropped it in line and experienced the difference over Packeteer right away. Complaints from students dropped as well -- MMOG worked again and we have no more AIM dropouts. It's the best decision I've made this year. An unanticipated benefit to this is that it has encouraged good behavior in that my users know it is best to save high bandwidth traffic for off hours. We have the NE3000-350 on a 150 Mbps pipe. We bought it the same time we had a large increase in our pipe, so I am just recently starting to see the graphs plateau at 120 Mbps (80% of 150, the point where neteq kicks in). It took our users a while to catch up to our larger pipe size, so I think the Neteq didn't do anything for about a year because we never hit 80% usage. So it is working well for us. I barely touch it as far as management goes. It lives up to the sales pitch for us and the price easily convinced us when we outgrew the PacketShaper we had. I want you to know how pleased I am with our NetEqualizer. Unlike our previous bandwidth management product which required constant tending and updates, the NetEqualizer works exactly as advertised: plug it in and forget it. Our Internet connection has run smoothly all year regardless of the kind of traffic thrown at it. Simply put this is one of the best products I've ever put into production. Thanks again. 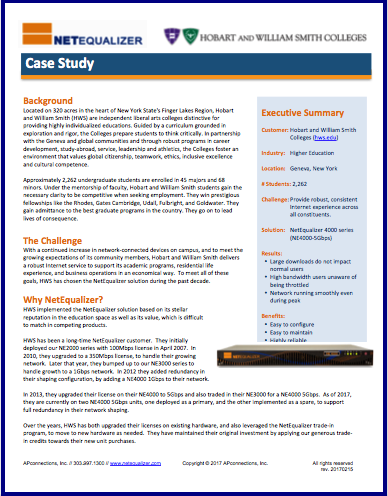 In May 2006 we switched bandwidth management products. We moved from traditional layer 7 traffic shaping to bandwidth arbitration. We looked at upgrading our current product and 3 other solutions. I am convinced protocol and layer 7 based filtering is dead. I expect P2P products to use SSL or TLS bypassing layer 7 filters. Ethically layer 7 filtering smells like content filtering, big brother, evil. Bandwidth arbitration keeps things simple. When the Internet connection reaches a tuneable level of utilization the arbitrator slows down longer lived higher usage data transfers based on the number of connections and their utilization. Per host connection limiting keeps P2P playing nicely. The chosen product? Net Equalizer. Based on the open source Bandwidth Arbitrator, it is easy to configure and highly customizable. Support has been excellent. With the netequalizer link size at ~20% below our average utilization our pipe remained completely usable. Interactive applications responded well while large transfers continued to function. The connection limits appear to keep bittorrent and gnutella functional and in control. Downloads are faster, latency is at pre layer 7 filtering levels (9ms vs 300ms), P2P protocols are usable again, and we no longer police content, we manage bandwidth. Support has been excellent with technicians responding directly to my emails with all technical levels of questions answered, good, silly, and questions about the inner workings of the appliance. I was instructed on cautions to take with any attempt at customization, and given the go ahead for some minor custom configuration without voiding the warranty. We have run the Netequalizer for 6 months. Results are phenomenal compared with our last product. Our Netequalizer box has been up for 116 days with no configuration changes from the start of the semester. I look at my Cacti graphs and the custom CGI reports for solace, as if I'm disappointed the appliance doesn't need more care and feeding. The ratio is the amount of of our pipe in use before any shaping (arbitration) takes place. The brain_size is the number of connections for the equalizer to track and act upon, I have seen this number reached only once on our system. The connection limit means we allow 20 incoming and 20 outgoing connections maximum for every host on our network. We had to set every one or our servers as an exception to this rule, allowing 50,000 incoming and outgoing connections for those. We also had to specify our link size. That's it end of configuration. I put the daemon in /usr/local/snmp/sbin/ and the mibs and snmpd.conf in /usr/local/snmp/share/snmp/. We created 2 custom CGI scripts. One script shows the complete current logfile on demand rather than the last however many lines the web interface shows. The other script shows total current connections, followed by a list of hosts with more than 3 connections, sorted by total outgoing and incoming connections. I modified some of the scripts provided in the /art directory to produce those results. Someone with more familiarity with the Linux bridge utilities could probably do better. Notice the hosts with more than 20 connections. Some of these are exempt servers, but others are workstations. Our firewall disallows non related incoming connections campus workstations, Netequalizer is in front of the firewall. I have examined some of these cases and many are P2P connection attempts that never truly connect to transfer data or are very short lived. We typically see about 20 to 30 hosts at or above the connection limit and about 100 hosts with more than 3 incmoing or outgoing connections, including all of our Internet servers. We have an out of band PC using Ntop to track what hosts on the network are doing. I have verified the output of the Netequalizer against our Ntop machine many times in the last few months. I have also on occasion initiated a large download from a fast Internet site when I notice one or two folks getting high data rates. At those times I have observed Netequalizer start to arbitrate, creating head room on the pipe to keep bursty interactive traffic responsive. Adams State University, found on Adams.edu website. Learn more about how NetEqualizer can help your college or university with our unique, affordable traffic shaping technology. The NetEqualizer Live Demo Site allows you to take a self-guided tour using our Product Demonstration Guide. For assistance at any time, please contact us for a guided walkthrough. 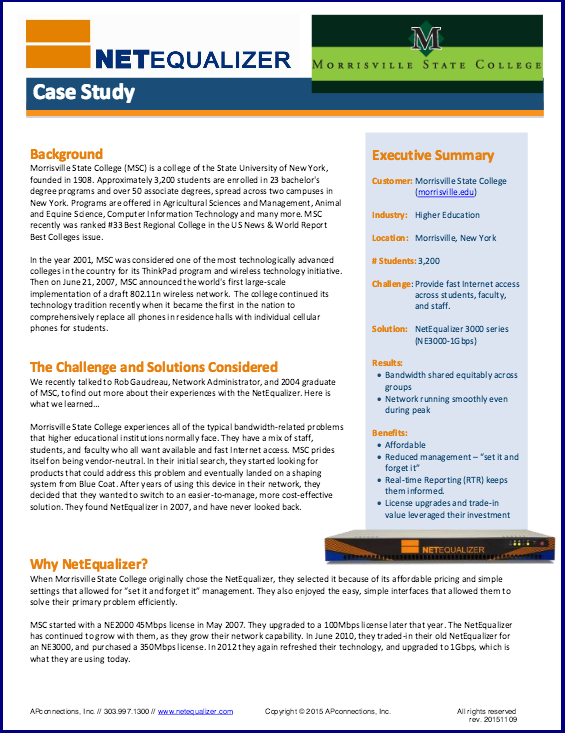 Read our College Case Study to learn more about Morrisville State's experience with the NetEqualizer. If you are interested in learning more about the NetEqualizer product series, or would like to schedule a technical consultation, please contact us at sales@apconnections.net or call 303.997.1300 ext 103.